Call them a band for soccer moms; say they are preaching to the choir. It doesn’t change the fact that the members of Casting Crowns are among the farthest-reaching Christian musicians at work today—the sonic equivalent of a Max Lucado book or a Sherwood Pictures movie. And with that settled, the group’s fifth studio album, Come to the Well, is as strong and yet relatively safe as anything it has done before—a dozen finely crafted songs that can and probably will soon double as sermon outlines at a church near you. Look forward to some good lessons. Petty infighting among believers is creatively addressed on the folk storyteller-like “City on the Hill,” where Melodee DeVevo’s violin and backing vocals add nice texture to the listening experience. “Spirit Wind” also has an airy acoustic charm to it coupled with straight-from-the-Bible source material. Of special note, there are several songs that speak directly to men. The soft rock anthem “Courageous” is based on the new film of the same name, a call for husbands and fathers to be true spiritual leaders. The emotionally stirring mid-tempo ballad “Just Another Birthday” gives voice to teen girls who need more attention from their dads. “So Far to Find You,” written by Hall and his obvious musical influence Steven Curtis Chapman, keenly parallels the thoughts of an earthly adoptive parent with those of the Heavenly Father. Following the tradition of epic Casting Crowns chart-toppers “Who Am I” and “East to West,” the most likely signature track of the future may be “Wedding Day,” loaded with soaring melody and an aim-for-the-heart lyric that drives home the idea of the church being Christ’s bride. If anything doesn’t work here, it’s the amped-up “My Own Worst Enemy” which attempts to be a hard rocker from a band that clearly does the adult contemporary thing much better. 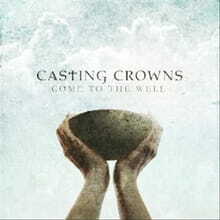 But that’s a minor quibble, and putting all art vs. ministry debate aside, Come to the Well is sure to be among 2011’s most popular and enduring Christian albums for good reason. Listen on Spotify while you read.